Here is something that I just learned yesterday that I didn’t know. This was one of those fun things where I knew every piece of the puzzle, but had never “realized” or “made the connection” between all of them. If you aren’t sure what extension methods are, I wrote a blog post about them back in 2008 that you can check out here. What I’ve done is just create a method that allows you to call .IsEmptyStringArray() on any string array to find out if it has any items in it. I realize that this is a fairly useless example, but it is contrived for the sake of the demonstration. However, I *CAN* call my extension method on that null array. The “syntactic sugar” part is that you aren’t actually calling a method on the null object at all. You are just calling your method and passing in the parameter, just like any other method. I really like that because it gives you a concise way to write your code without the same null check over and over and over again throughout your codebase. You can just check in the method and then get on with what you’re doing. Just a quick note to document a “gotcha” that cost me quite a bit of time today. I am currently working on my company’s second Asp.Net MVC 2.0 application. Our first one was a huge success and (to me) MVC is way more fun and productive than WebForms, so doing as much new development using MVC instead of WebForms is a no-brainer. 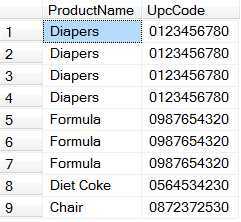 That code will call the Edit action on the ProductController and pass in the id of the product to edit. The controller gets the product details and then returns a partial to the page, which is then inserted into the div. I was trying to debug the controller action, but after I had edited a product once, the breakpoint wouldn’t catch anymore. I figured that I was dealing with a caching issue and the method wasn’t even being called, but I couldn’t find where I even had output caching configured in MVC. I knew that I wasn’t having this problem in our previous application, so I started comparing files and looking for answers. Nothing was really giving me any clues, and everything appeared to be set up the same way. 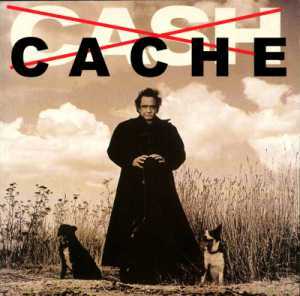 Finally, in exasperation, I did a “Find in Files” in Visual Studio in the other solution for just the word “cache” since searching for “outputcache” had failed me. I had seen that in the last application, had read the documentation on ajaxSetup, but I didn’t really understand all of the ramifications of it. Apparently, jQuery in all of its awesomeness will actually cache ajax calls for you to speed up your page. That’s definitely awesome, but unexpected caching can certainly screw up your day. Today on Twitter, Sahil Malik asked the question “Is there any reason ever to use Request.QueryString over Request.Params?” (link – for as long as it persists on Twitter). For QueryString itself, there is practically no reason not to use the less specific collection, as QueryString is always checked first. That means that there is a small performance hit in Request.Params as it will check all collections regardless and not one in just calling Request, as it returns the first one it finds. If you are trying to get at the Forms, Cookies, or ServerVariables collections, there is a performance hit (albeit small) no matter which way you turn. (Information on the happenings inside the .Net Framework are available on this Hanselman post from a few years ago. There is an issue, however, if you want to access any of the other collections by using either Request or Request.Params. And really, this is the code smell that I was worried about when responding to Sahil earlier today. Let’s make an example page here. I made this using Asp.Net WebForms (to hopefully have the widest base of understanding). Here is the meat of the .aspx page. You shouldn't see me unless you are an admin. When we click the button, the cookie value is checked and since it is false, we get the sad news that we aren’t an admin. Okay, let’s now assume that someone is curious if you are using simple cookie checks, so they look inside Firefox to see what the cookies are on your site. Now, let me take a chance that the operator of this site is being sloppy and is using Request instead of calling the value from the cookie collection explicitly. I’ll add ?IsAdmin=true onto the querystring to mirror the cookie and then click the button. Since the QueryString collection is checked first, I’ll be overriding the cookie in this instance. Well, that’s not good. What if we actually just check the cookie value instead of being lazy? Now when I try the QueryString hack, the page is safe. This doesn’t solve all of the problems with this page, though. I’m not pushing this off as some airtight secure solution. What I’m hoping to point out is that coding hard and even though we are given certain shortcuts, you really have to understand the ramifications of your code before throwing it out in the wild. Last Time, we looked at ROW_NUMBER() and saw a little of how it works and how we could use it to remove duplicates. Another one of my favorite uses for ROW_NUMBER() is to get only one row from a one-to-many join. I’ve had situations at work where I need to return one row per Person, but each person had several addresses, several injury codes, and several contacts (people working their case). In many of those cases, there is nothing to indicate which one of those rows should receive precidence over the others. One might just select from those tables and then take just the MIN() of the primary key, grouping by all other fields, but that makes for very messy and hard to maintain code in my opinion. ROW_NUMBER() gives us a much easier way to handle this problem. 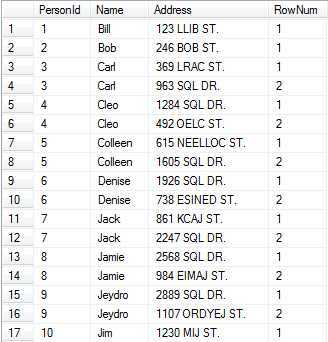 Examine this sql script that gives us a Person Table and a PersonAddress table. 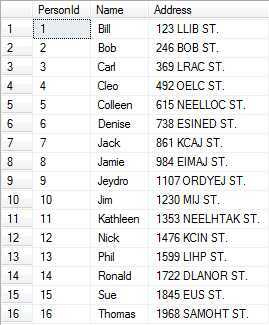 One person can have many addresses, but there is no way in the schema to give precidence to one of the addresses over any of the others. You can see now that all we have to do is limit the result where the RowNum is equal to one and we have something that we can use (the CTE) in further joins or in reports to ensure that we don’t introduce duplicates to our query. 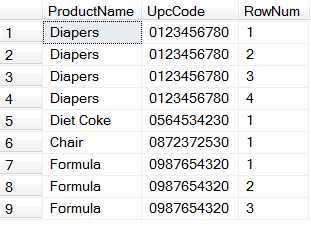 Sometimes when you are performing queries, you have data that does not have a primary key and contains duplicate records. If it had had a primary key, you could group on the columns that constitute a duplicate and just keep the MIN or MAX of the primary key, deleting the others. However, lacking that primary key, you have no way of uniquely identifying a row. Additionally, UNIQUEIDENTIFIER types don’t work with MAX and MIN, so you’d have a hard time picking a row in that case as well. 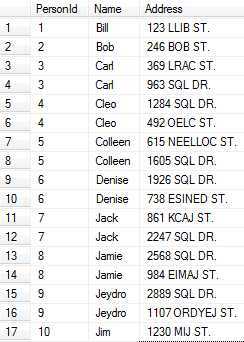 One option is of course to add an identity column to the table and do the operation that I described. However, sometimes you don’t have the appropriate permissions or just aren’t allowed to modify the table to do that. 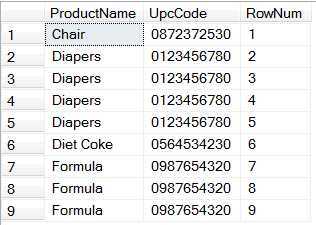 You can use the ROW_NUMBER() function to assign a unique row number to each row by partition. I’ll talk a little more about partition later, but when not explicitly specified in the query, the partition refers to the entire table. Okay, now all we have to do is keep the records that get assigned a one, forsaking all others. Change that same section of code again to read like this and then run the script. Note, I am using the CTE syntax here. Now we have a table with no duplicates. That’s it, that is all there is to it. In my next blog, I will cover how we can use this trick in joins to ensure that we only get a 1 to 1 join, even when the data is 1 to Many.